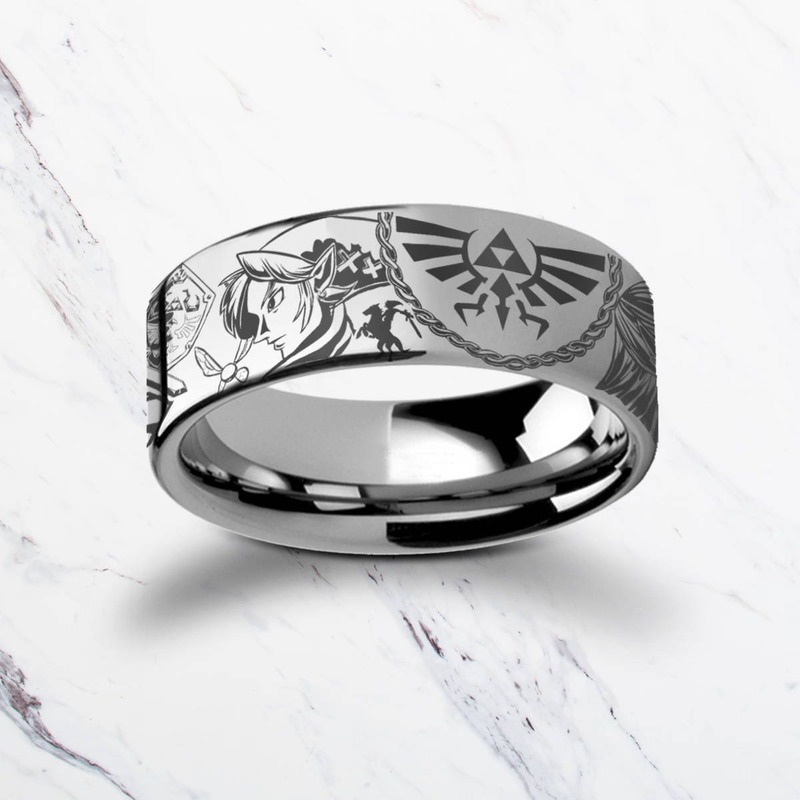 This is a flat polished tungsten carbide ring with an intricate The Legend of Zelda mosaic engraving. The image contains various characters and objects such as an Ocarina, music notes, master sword and shield, princess Zelda along with many more symbols and imagery. The symbols have a slight gold tint to them and can be changed to any symbol, please feel free to message us directly. 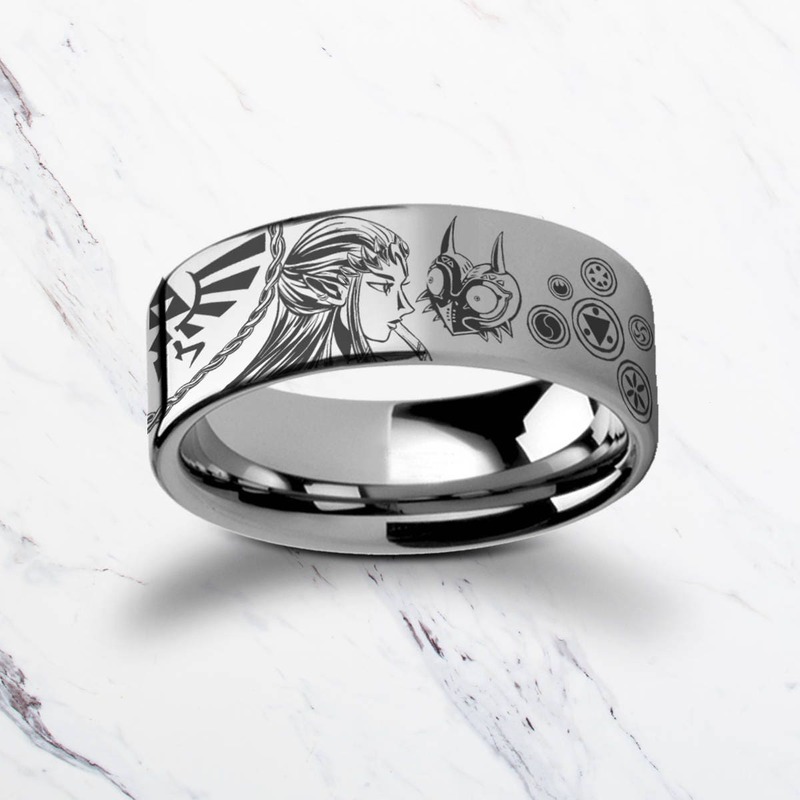 This ring is gorgeous! Great quality! I’m so happy with it! My husband is going to love it! The ring arrived way sooner than expected and came in a nice ring box. Aaron is so nice and easy to work with on the order! I’ll definitely be a repeat customer! My daughter in law will love it. Heavy and sturdy ring, looks just like in the images. Very fast shipping, thank you. It came very quickly—looked amazing and made the man of my life so very happy! Thank you Infinite Jewelry. I would buy from them again no hesitation. I communicated what I wanted to the seller before I actually made my purchase and they were very responsive and easy to work with. I purchased on a Friday and got the ring the following Monday so I was blown away by the speedy service. My fiance loves this ring. It's going to be perfect for our wedding day. It's got some weight to it and feels sturdy. Amazing quality.